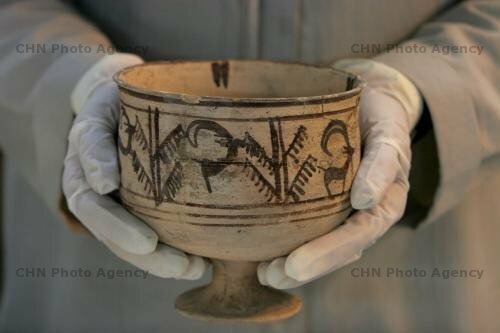 The Cultural Heritage, Tourism and Handicrafts Organization (CHTHO) announced on Monday that it has recently completed the production of a documentary about the ancient Iranian earthenware bowl bearing the world’s oldest example of animation. Directed by Mohsen Ramezani, the 11-minute film gives viewers an introduction to the bowl, which was discovered in a grave at the 5200-year-old Burnt City by an Italian archaeological team in late 1970s. The artefact bears five images depicting a wild goat jumping up to eat the leaves of a tree, which the members of the team at that time had not recognised the relationship between the pictures. Several years later, Iranian archaeologist Dr Mansur Sadjadi, who became later appointed as the new director of the archaeological team working at the Burnt City discovered that the pictures formed a related series. The image is a simple depiction of a tree and wild-goat (Capra aegagrus) also known as ‘Persian desert Ibex’, and since it is an indigenous animal to the region, it would naturally appear in the iconography of the Burnt City. The wild goat motif can be seen on Iranian pottery dating back to the 4th millennium BCE, as well as jewellery pieces especially among Cassite tribes of ancient Luristan. However, the oldest wild goat representation in Iran was discovered in Negaran Valley in Sardast region, 37 kilometers from Nahok village near Saravan back in 1999. The engraved painting of wild goat is part of an important collection of lithoglyphs dating back to 8000 BCE. However, wild goat representation with a tree is associated with Murkum, a mother goddess who was worshipped by all the Indo-Iranian women of the Haramosh valley in modern Pakistan, which culturally had closer ties with Indus and subsequently the Burnt City civilisations, than Mesopotamia, which could have influenced the ancient potter who made this unique piece. Full article here. See also our earlier feature on Megalithic manga, cartoons and graphic novels: Part I below. Did Chinese visit Australia 600 years ago? Reblogged this on LE ARTISTE BOOTS.